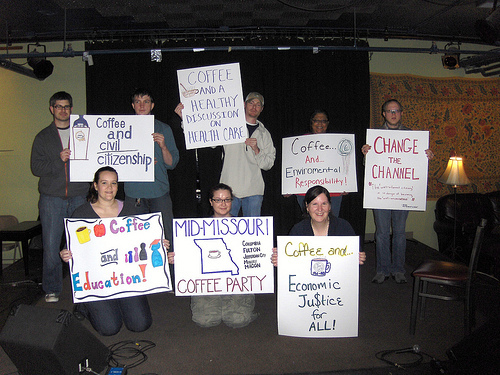 Take a look at the Coffee Party Flickr photos. Note the profound lack of diversity: Virtually nothing but middle aged whites. Why, they must be racists! Meanwhile, Alfonzo Rachael was a keynote speaker at a TEA Party rally recently. Economic justice for all means that if you earn $100 the government will take it away and give it to the drug addict who earns nothing. I admired the Tea Party woman on Letterman who used to spend her time, in part at least, helping people who at the time couldn’t help themselves be self sufficient. It’s funny. The North Korean ideal of Juche means self reliance. Guess it’s all about balance. Fun times. Pendulums and all that jazz.